This book by Mary Wohlgemuth features an array of projects by 20 leading designers (including myself). Each artist has contributed ideas, tips, and innovative techniques for adding color to silver, bronze, and copper clay jewelry. 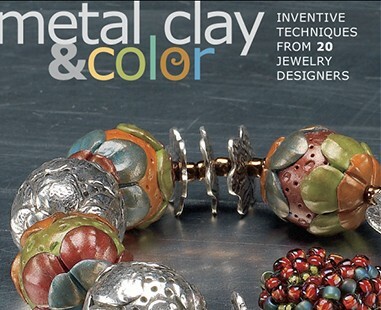 Metal Clay & Color gathers the work of 20 top designers who are adding color to their metal jewelry creations by using polymer clay, ceramics, resin, colorful patinas, fireable gemstones, seed beads, and more. 25 innovative projects offer plenty of inspiration, a compelling variety of styles, and professional, step-by-step instructions and photos for rings, bracelets, pendants and earrings. Advanced-beginner and intermediate jewelry makers will learn novel ways to add color to metal clay from these top designers.